The most comprehensive bibliographic database of engineering research literature, containing references to over 5000 engineering journals and conferences. About half the citations (from 2600 journals and conferences) include abstracts and indexing in the records. Coverage: 1884 – present. SciFinder is the most comprehensive bibliographic database for scholarly research in the field of chemistry. It contains over 29 million citations and indexes over 10,000 journals, covering all aspects of chemistry, including chemical aspects of: biology and life sciences, engineering and materials science, food science, geology, medicine, physics, and polymer science. SciFinder also allows searching of chemical substances, chemical reactions, and includes some property data and spectra. It is the online version of Chemical Abstracts. Coverage: 1907 – present (with selected pre-1907 material). Cited Reference Searching: 1996 – present. SciFinder can only be used by UC students, faculty and staff. Use Web of Science to find scholarly articles in all disciplines, including chemical engineering and materials science. This database can also be used to identify articles that cite an author or article that you specify. Coverage: 1900 – present. Cited Reference Searching: 1900 – present. Auto-Alert: Email me (weekly or monthly) when articles are published on a given topic. HOW? : Sign-in to WOS. Run Search. Click: SEARCH HISTORY (top left). Click: SAVE HISTORY/CREATE ALERT. Name it, specify frequency & format, save it. Citation-Alert: Email me when someone cites article X.
Scopus indexes, selectively abstracts and provides citation analysis for approximately 20,000 peer-reviewed journals from more than 5,000 international publishers, as well as 2,600 open access journals, published sets of conference proceedings, trade publications, books, patents (from the USPTO, European Patent Office, Japan Patent office, World Intellectual Property Organization and the UK Intellectual Property Office) and millions of selected web pages. Coverage extends across disciplines in the life and health sciences, the physical sciences, the social sciences and the arts and humanities. Articles from popular magazines and scholarly journals for the humanities, social sciences, physical and biological sciences, engineering, business and interdisciplinary fields, with over 5,500 full-text periodicals. Also includes indexing for some newspapers, books and primary sources. Coverage: 1887 – present. –Use Google Books to search for phrases or topics you are interested in (works well for technical terms). The UC Davis STEMWiki Hyperlibrary consists of seven pseudo-independently operating and interconnected “STEMWikis” that focus on augmenting post-secondary education in STEM (Science, Technology, Engineering and Mathematics) fields. UC Davis has the ACS (American Chemical Society) Symposium books online from 1974 on. Volumes published in 2010 and earlier are also available in print. To locate a print volume: search the Library Catalog for “ACS Symposium” then add either the volume number or title you want. Founded in 1949, Advances in Chemistry series was the predecessor to the ACS Symposium Series. Critical reviews covering primary research literature in the biomedical, life, physical, and social sciences. Can provide a good overview topics you are not familiar with. Chemical fields covered include: analytical chemistry; biochemistry; physical chemistry; pharmacology and toxicology; and chemical and biomolecular engineering. Tables of Contents only: 1984 – 1995. Use the library catalog to find these in print. Theo Hahn; U. Shmueli; A. J. C. Wilson (editors). 1984-2012. Dordrecht, Holland; Boston, U.S.A. Kluwer Academic Publishers Group, most current volumes availale through Wiley. Use the link above or this alternate link to access the volumes below. Norman F.M. Henry & Kathleen Lonsdale (Editors), International Union of Crystallography, Kynoch Press 1969. Freely available via Internet Archive. The RSC (Royal Society of Chemistry) ebooks package, includes over 1000 books published since 1968, including the Specialist Periodical Reports series and Tutorial Chemistry Texts. Over 1300 ebooks focused on chemistry, physical sciences, biosciences & engineering. The UC’s purchased all 2011 and 2012 ebooks, including IEEE ebooks (older years on IEEE Xplore platform). Use the UCD Library Catalog or MELVYL catalog to find which journals we subscribe to, either online or in print. Online subscriptions: the catalog will give the link. NOTE: we sometimes get online content for different years from different sources, R-E-A-D the fine print. Print subscriptions: the catalog will give you the call number, location, and indicate whether or not it is checked out. Print and online journals that UC Davis has an online subscription to. You can use Google Scholar to search for journals (or articles). Google has no way of telling you which online journals UC Davis subscribes to, unless you set your Google Scholar preferences to show UC-eLinks (see below). Google Scholar: How do you actually GET the articles? On-Campus: You should be able to access any online journal that UC Davis subscribes to. Off-Campus: You must install the VPN client first, to access online journals UC Davis subscribes to. No UCD Online Subscription? : We may have a print subscription. Check the library catalog . If we do not have a print or online subscription, you can request articles through Interlibrary Loan. Enabling the 2 features below will make your Google searches easier and more productive. 2. Add “Import into Endnote” this will make it easier to import citations to the Endnote citation management software. You should have three Library links as shown below (Open WorldCat, California Digital Library, and University of California Davis). Now when you search in Google Scholar: you should see the ‘UC-eLinks link on the right side of your search results. Select: Show links to import citations into ENDNOTE (choose ENDNOTE, not BibTex). Now when you search in Google Scholar: you should see the ‘Import into EndNote’ link below each of your search results. can provide focused, highly useful summary of topics, processes and products. can be extremely useful in narrowing your topic, understanding the scope of your inquiry, and/or getting up to speed on a complex topic quickly. getting a highly focused book reference (available as a PDF, and substantially shorter than a typical book). An online encyclopedia focused on chemical engineering, a very good resource for topics involving manufactured items, materials, or processes used in manufacturing. Another online encyclopedia focused on chemical engineering, Ullmann’s is also a very good resource for topics involving manufactured items, materials, or processes used in manufacturing. A large collection of engineering handbooks. Provides a broad focus on engineering. A large collection of engineering handbooks. Finding sources for bulk chemical pricing and market data can be quite difficult. In many cases these data simply may not be available. Use this guide to search for available information. ORCID iD: What is it? ORCID (Open Researcher and Contributor ID) is an independent, non-profit, community-driven organization that provides unique, persistent identifiers (ORCID iDs) for researchers in all fields. will soon make it possible to create an automatically updated list of your publications (if: you include your ORCID iD when submitting manuscripts; enable the Auto-Update feature; publishers allow/require ORCID iDs as part of manuscript submission, as increasing numbers are doing). 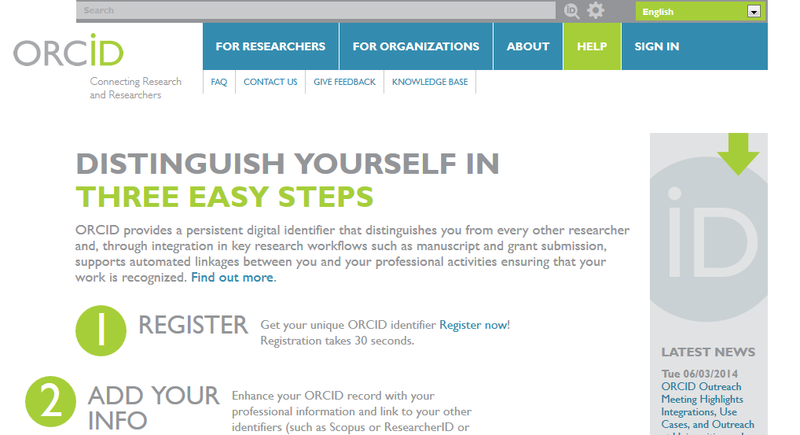 Go to ORCID and click “register now” to obtain an ORCID iD. All aspects of your ORCID record are entirely under your control. Link other IDs you have to your ORCID iD (Web of Science Reseacher ID, Scopus Author ID, Loop profile, etc.). Consider unifying the “beyond the PDF” aspects of your scholarship (Google Scholar Profile, Twitter account, blog, FigShare, GitHub, ImpactStory, etc.) by listing them in the “Websites” section of your ORCID iD. Include your ORCID iD on your: departmental web page/profile, C.V., email signature, twitter profile, grants, and anywhere else you provide a list of your work. Google Scholar Profile: What is it? If you have publications indexed in Google Scholar, you can create a profile that will show up when people search on your name. It will display your publications, any information you provide, and a set of metrics including h-index. Go to Google Scholar Citations and sign in with your Google account. You will then be asked for your name, affiliation, etc. Next, Google Scholar will automatically suggest publications to add to your profile. Select the ones that are yours to add to your profile. Add your research interests as keywords, which can then be used to search on by people looking for other researchers in a field. A Google Scholar profile will show up at the top of results when people search for your publications in Google Scholar. It increases visibility of your work by providing a bibliography, indicates which publications are yours if you share a common name. It also shows a citation count to your work, provides an H-index measure. See Google’s FAQ for answers to how to add missing publications or correct other errors. Altmetrics: is a term coined in 2010 to refer to metrics that offer alternative (or additional options) to widely accepted metrics such as journal impact factor, number of citations to a given article, h-index, etc. Altmetrics provides a social media profile for an article, including: blogs, tweets, Facebook, Google+, CiteULike, Wikipedia, Mendeley, Connotea, Reddit, and news outlets that have referenced the article. Includes links to postings and metrics. Altmetrics Bookmarklet: is available free. Grab and drag the ALTMETRICS Bookmarklet to your toolbar. Altmetrics sells access to three products: Explorer, Embeddable badges, Altmetric API. Add the Altmetrics Bookmarklet to your tool bar, visit any paper available online, click the bookmarklet to get article level metrics for that paper. Track the impact of your articles, or articles of interest to you, in social media. Researcher ID is a unique identifier scheme developed by Thompson Reuters and used in Web of Science as well as being compatible with other ID schemes. institution name) to create the ResearcherID. You will then be able to link the ID to ORCID. ResearcherID, like ORCID and SCOPUS author ID, is used to tell authors with similar names apart and produce profiles of author work. If you use Endnote or Web of Science, ResearcherID ties into these systems seamlessly. Use your ResearcherID on your CV, grants, and other profiles. Once you have gotten the ResearcherID, you can add to your publications list by clicking “add publications” and then searching Web of Science, adding a RIS file from Endnote or RefManager, or connecting directly to Endnote. You can also connect to ORCID, and import the publications from your ORCID profile (or vice-versa). Scopus Author ID: What is it? SCOPUS is a database of literature from all fields, produced by Elsevier. The database automatically assigns unique ID numbers to authors. These IDs help SCOPUS distinguish between similarly-named authors as well as helping to group all the documents by an author together. If you have publications indexed by SCOPUS, you have automatically been assigned a SCOPUS author ID number. You can check this by going to SCOPUS and entering your information. In addition to being the tool SCOPUS uses to identify authors, some grant agencies will ask you for SCOPUS ID numbers. How to improve your profile and correct errors. You can add your SCOPUS ID to your ORCID profile by clicking “add to ORCID” from your author page in SCOPUS; directions are here. Once you do this, you will be asked to log into ORCID, to verify that you authorize SCOPUS to access your ORCID account, and then you will walk through adding the appropriate SCOPUS profile and publications to your ORCID profile. Endnote is citation management software that allows you to store, manage, and format bibliographic citations, and easily change formatting of citations in Word documents. Available free to UC Davis students, faculty & staff (campus has a site license). Endnote client/desktop: Requires installation of software, more powerful, best choice for faculty and grad students. Endnote Online: Requires online registration. Usually the best choice for undergraduate students. Commonly used citation styles including: APA, CSE, Chicago, MLA and others. American Chemical Society (ACS) guidelines for citations of all types. See Table 14-2 (pgs 292-293) for common types of references with examples. conventions for forumulas, elements, substances, tables, etc. Use to look up journal abbreviations used in chemistry. Short & efficient guide to IEEE/engineering citation format. Citation formats and editorial guidelines for IEEE Transactions, Journals, and Letters. Mendeley is citation management software. Creating an account will give you access to both the web version and the desktop version. Guides created for library classes taught for the Chemical Engineering department are listed here.